(Bloomberg) -- It was early on a February morning when Charlotte, North Carolina, Mayor Vi Lyles got the call: BB&T Corp. would combine with SunTrust Banks Inc. in the largest bank deal in a decade and wanted to place its headquarters in her city. Charlotte didn’t even have to offer any incentives to lure the lending giant to the so-called Wall Street of the South, where a typical home is selling for less than $300,000, according to Zillow. "They did not ask us for anything," Lyles said in an interview. The city is finding strong interest from other companies, too, she says: "They’re probably targeting us because we talk a lot about our affordability." That’s unusual at a time when states and local governments clamor to land big companies by offering generous tax breaks and incentives. But that practice has come under renewed scrutiny after Amazon.com Inc. abruptly reneged on a deal to build a new hub in New York after public outcry over the generous subsidies the city offered to a company with a market capitalization nearing $1 trillion. There’s good reason for the merged banks to make Charlotte its home. Bank of America Corp., the second largest U.S. bank, is based there. Bank of America and Wells Fargo & Co. together account for about 9 percent of jobs in the Charlotte area, according to a 2018 report by Moody’s Investors Service. 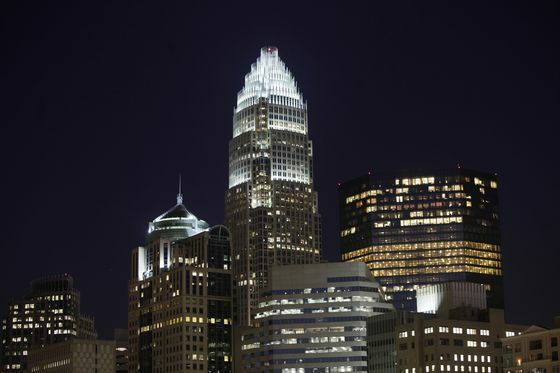 BB&T spokesman David White said the companies chose Charlotte because it’s one of the top "financial centers" in the U.S.
It’s not that Charlotte completely eschews incentive packages. The city and Mecklenburg County reportedly offered Amazon $270 million as part of its bid for HQ2. And Honeywell International Inc. said in November that it received state and local incentives as part of its plan to move its headquarters to Charlotte from Morris Plains, New Jersey. Lyles, who compared the HQ2 race to a "pageant," said the process taught the city more about its potential for future deals. "What we learned is how to put together a good package that we can use over and over again," she said. Her pitch to Honeywell Chief Executive Officer Darius Adamczyk was simple. "I said, ‘The quality of life in our city will make up for any amount of money that somebody’s offering you.’ I really do believe that."